Above: Queen Victoria overnighting in Venice at the Marittima Basin. 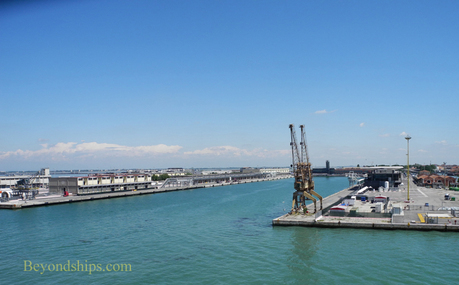 Above: The main cruise port in Venice, the Basin Statione Marittima (Marittima Basin). 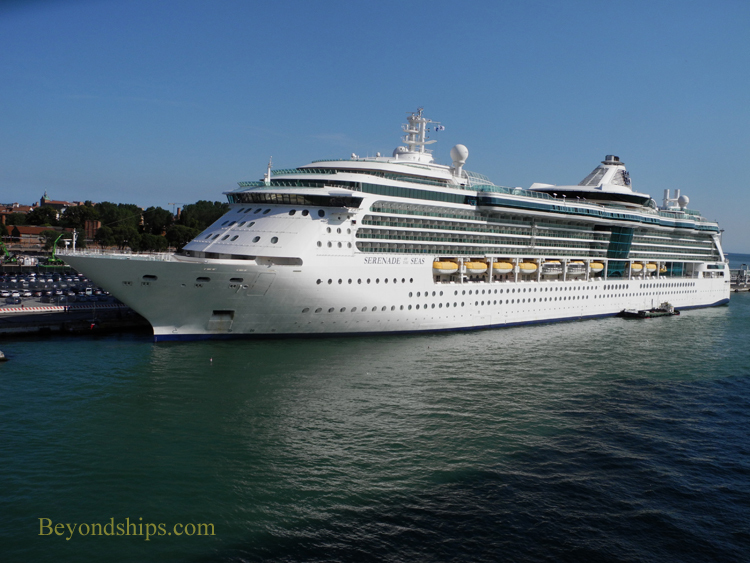 Below: Serenade of the Seas berthed in the Marittima Basin. Venice is a cruising powerhouse. Not only is it an important port of call for cruises beginning elsewhere but it is one of Europe's leading cruise embarkation ports. 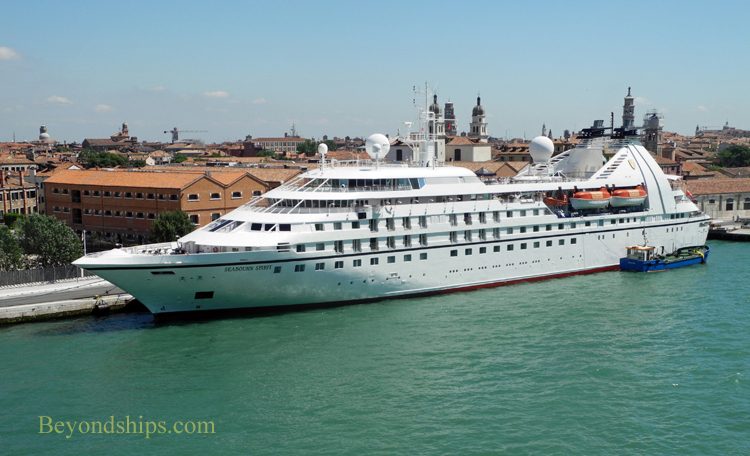 In 2011, 1.7 million cruise passenger transited Venice. 500 ship visits a year is now the norm. The Venezia Terminal Passeggeri is at the back end of the historic part of Venice. Ships arrive there via the Guidecca Canal after having passed the major tourist attractions of the city. It is not far from the Santa Lucia railroad station or from the car parking lot (Piazzale Roma) that is the end point for cars coming to the islands over the causeway from the mainland. The cruise terminal has two areas. The largest of these is the area surrounding a rectangular body of water enclosed on three sides known as the Bacina Stazione Marittima or Marittima Basin. Ships can dock along either side of the basin. They can also dock on the other side of the quay that forms the western side of the Marittima Basin. Thus, the port can handle several large cruise ships at one time. This area has four terminal buildings. The cruise lines often run a shuttle bus from the terminals to the Piazzale Roma where there is local transporation nearby. Some other ships organize a boat service that will take you, for a fee, to the embankment near St. Mark's Square. They also have a meeting point for taking you back to the ship. 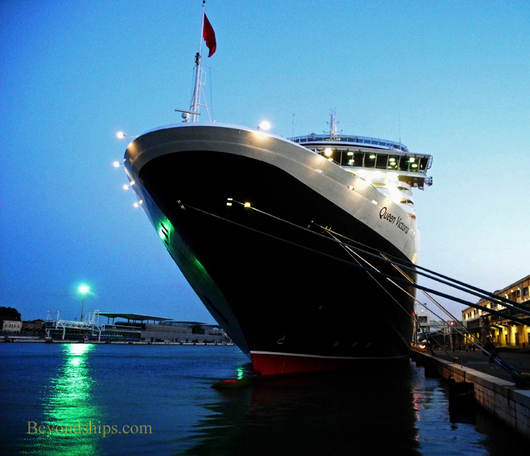 Smaller cruise ships can dock along the Guidecca Canal at the San Basilo terminal. It has its own terminal building. Right: Seabourn Spirit berthed along the Gildecca canal at the San Basilio terminal.